Where do SATA drives get their power when using a PCI SATA controller on oler PCs? I've been looking into PCI SATA controller cards online for an older PC and noticed that the ports only have the SATA cable connector and the Power supply does not have the SATA power connectors. I also had a few external eSATA drives which don't power up unless I also plugin the USB cable. Therefore I realize that SATA and eSATA do not carry power and need power else where. 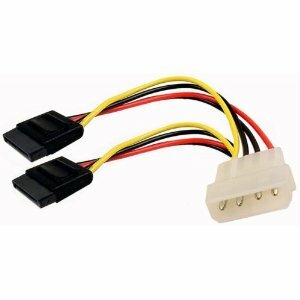 When converting older PCs to use a PCI SATA controller how do you provide power to the SATA drives? Anticipating the answer to be some kind of converter cable (which I was unable to search for) then can older power supplies handle added drives? (Assuming a 4 port SATA controller means 4 more drives the power supply has to endure). Or do you have to get a second poer supply and kinda jerry-rig it into an old case? They definitely do sell converter cables that plug into an old-style Molex 12v power-cable and have one or more SATA-power connectors on them. They do allow running a couple of SATA drives from each plug. Not the answer you're looking for? Browse other questions tagged power-supply sata or ask your own question. How can I use an old PATA hard disk drive on my newer SATA-only computer? Can a PCI-E 6 pin cable be used in-place of an 8 pin cable?